Chambers finished eighth in the regular-season standings with $81,178 in earnings, cracking the top 15 to clinch his first Wrangler NFR berth. In a sport full of pretty unique characters, Bridger Chambers certainly stands out. First off, at 6 feet 5 inches, he’s one of the tallest cowboys on the PRCA circuit. And yes, he played basketball too. 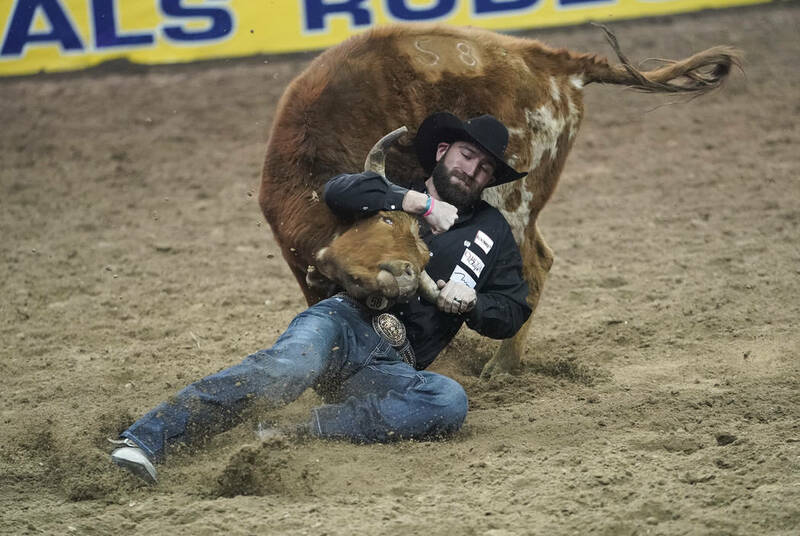 In fact, he’s believed to be the only athlete to compete in the NAIA national championship basketball tournament and the College National Finals Rodeo in the same year, as a senior at the University of Montana Western in 2012. Second, he spent a year as a special education teacher after graduating from Montana Western. Third, he and his dad Keith have run a drug dog business together for the past five years. So throughout the year – mostly from September to May, since schools are the main customer – dad and son will make upwards of 500 visits all across the state of Montana and beyond. Obviously, there’s a huge time commitment, too. As such, Bridger has never really been able to rodeo all that hard since getting his PRCA card in 2013. That’s kept the lanky steer wrestler from having a legitimate shot at qualifying for the Wrangler National Finals Rodeo. And it paid off. Chambers finished eighth in the regular-season standings with $81,178 in earnings, cracking the top 15 to clinch his first Wrangler NFR berth. He’s taken full advantage over this past week-plus, earning more than $55,000 to go along with the $10,000 bonus each NFR contestant receives. He’s jumped to sixth in the world standings with $146,390 for the year, and through eight go-rounds, he’s at third in the lucrative NFR average. While the 29-year-old from Stevensville, Mont., has certainly enjoyed the competition so far, that wasn’t the most memorable moment of the week. Chambers, who has a daughter and three sons with wife Kristen, hopes to create another memory or two in Saturday night’s 10th and final go-round.